This is a 3 part (50 minutes per class) unit we're using in May 2015 in STEM class. For more information also see the Redstone Circuit page of the Official Minecraft Wiki. Teachers: Download this MinecraftEDU world, modified from this CC-BY licensed world by Tim Polmear. (Created in MinecraftEDU 1.6.4) This remix is also licensed CC-BY. 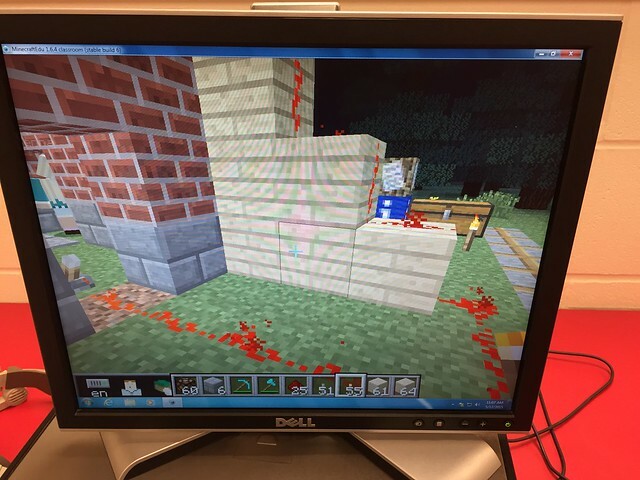 More information about ways we used MinecraftEDU is available, including how we use it in Maker Studio. Complete requirements for each level. Dr. Fryer will teleport you into the next level after verifying you've completed it. Click links below to view build recipes for each item and video tutorials. A YouTube playlist of instructional videos for this lesson is available. After your teacher teleports you to to the Shared Building Area, work together to build the coolest rollercoaster you can. Initial planning ideas for this project are available in this Google Doc.